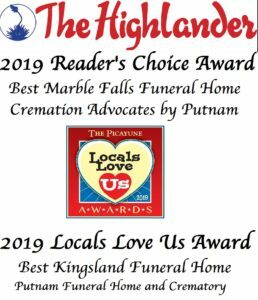 The Putnam Family of Funeral Homes (Bertram Funeral Home in Bertram, Cremation Advocates by Putnam in Marble Falls, and Putnam Funeral Home and Crematory in Kingsland) continues to win the local awards for Best In Class. We do so by going above and beyond and because we understand that we have only one opportunity to make this right. Remember our billboard – #YODO? From writing the obituary to personalizing memorial folders and celebrations of life, to introducing grief therapy dogs in training, and offering different funeral home concepts (traditional, contemporary, and familial), and even offering different funeral planning products from final expense policies to prepaid funeral contracts, we do everything we can to advocate for you before, during, and after your time of loss and help you make meaning out of an emotional time. Every employee is also a community volunteer and Putnam supports several local causes and organizations as we believe that investing in our community keeps our community strong. It also enables us to build relationships to better serve you when you need us the most. We are local and family-owned with the ONLY on-site crematory in the Highland Lakes area. Not only do we Keep Your Loved Ones Close and provide Excellence in Remembrance, but Putnam also Cares! We provide cremation and burial services, celebrations of life, and preplanning services to Horseshoe Bay, Spicewood, Lakeway, Austin, Liberty Hill, Temple, Bertram, Oatmeal, Burnet, Tow, Kingsland, Llano, Highland Haven, Granite Shoals, Cottonwood Shores, Marble Falls, Meadowlakes, Double Horn, Round Mountain, Johnson City, Blanco, Boerne, San Antonio, Fredericksburg and beyond. Central Texas entrepreneur, leader, funeral home owner, and philanthropist Chris Putnam successfully defended his research dissertation, “A Leader’s Perspective to Retaining Millennial Workers: A Qualitative Triangulation of Job Embeddedness Theory and Leader-Member Exchange,” to earn his PhD in Business Administration with a concentration in organizational leadership from Northcentral University on November 28, 2018. Dr. Putnam also holds a MBA and BA in Business Administration from Ottawa University and a Diploma of Funeral Service from Commonwealth Institute of Funeral Service. Dr. Putnam’s research participants included members of the baby boomer and generation x generations who were small business owners in Central Texas and employed millennials. He found these leaders expressing frustration over a perceived lack of work ethic. Given the lack of existing information, most of the leaders did not have a specific strategy to improve relationships and increase retention; and the strategies they did employee contrasted significantly with what little literature exists that pertains to supervision and mentoring across generations. Based on his research and conclusions, Dr. Putnam believes that there is a huge misunderstanding and communication barrier between the various generations. The millennial generation is a very ambitious and productive group that walks to the beat of its own drum. The baby boomer generation is very similar, and much can be learned about its influence. The size of both the baby boomer and the millennial generations is squeezing the smaller generation X and forcing its members to acclimate and adapt to both generations to be successful. And for those generation Xers who have waited patiently for their baby boomer supervisors to pass them the torch, they will be sorely disappointed when it is the millennial who grabs it from them. Dr. Putnam thanks his wife Jessamyn for supporting him through his doctoral experience. The four-and-a-half-year journey was full of studying, teaching at Schreiner University and Central Texas Community College, and research engagements that came with emotional highs and lows. He also thanks his children: Liam, Connor, and Anson for the missed evenings and weekends and life interruptions his goal caused. Last by not least, he wants to recognize and thank his Putnam team: Jim Simmons, Eli Heatley, and Brittany Carrington, for picking up his slack and maintaining an extraordinary level of service at Putnam. Dr. Putnam’s research broadened the theories of job embeddedness and leader-member exchange and he plans to apply his findings to the Putnam organization and teach other business and organizational leaders how to increase employee retention by using positive relationships and encouraging a work-life balance. Dr. Putnam launched the Putnam brand with Putnam Funeral Home in Kingsland, Texas in 2000. After adding in a crematory in 2006 that is now the only crematory in the Highland Lakes area, Dr. Putnam opened Cremation Advocates by Putnam in Marble Falls in 2017 as a contemporary and alternative approach to a funeral home and opened Bertram Funeral Home in 2018. Putnam Funeral Home and Crematory, LLC is located at 145 Texas Avenue in Kingsland, 325-388-0008, www.PutnamCares.com,; Cremation Advocates by Putnam is located at 206 Ave. H, Suite#204 in Marble Falls, 830-798-8413, www.CremationAdvocates.net; and Bertram Funeral Home is located at 1010 East TX-29 in Bertram, 512-355-8201, www.PutnamCares.com. Putnam is a member of Selected Independent Funeral Homes, National Funeral Directors Association, the Cremation Association of North America, the International Cemetery, Cremation, and Funeral Association, National Association for Grieving Children, and Business Network International. For more information or to request Dr. Putnam as a speaker, please email him at chris@putnamcares.com or call him at 325-388-0008. Putnam Funeral Home and Crematory, LLC, announces its recent expansion into Bertram, Texas with the opening of Bertram Funeral Home at 1010 East TX-29. Bertram Funeral Home is dedicated to serving the residents of Bertram, Oatmeal, Liberty Hill, Burnet, and the surrounding areas. The goal of Bertram Funeral Home and Putnam is to invest in the community and provide exceptional and personalized service during a difficult time. This familial funeral home concept not only provides space for services and visitations, but it also provides our Bertram families and neighbors with access to the Putnam private crematory. Putnam owns the only crematory in the Highland Lakes area and reserves its use exclusively for Putnam client families to ensure the integrity of our quality control and identification procedures while providing our families with the peace of mind that their loved one never leaves our care. Bertram Funeral Home also offers the services of the only area Certified Celebrant. Putnam is dedicated to the ones you love, and our caring and knowledgeable staff is here to remove as much stress as possible from the funeral process and to help you build a positive foundation for grief. The staff at Bertram Funeral Home strives to provide excellence in remembrance. Everyone deserves a funeral or memorial that expresses how special they are. We at Bertram Funeral Home are committed to commemorating and honoring each person who enters our care. Please call us at 512-355-8201 to schedule a tour of our facilities. Bertram Funeral Home is located at 1010 East TX-29 in Bertram, Putnam Funeral Home is located at 145 Texas Avenue in Kingsland, and Cremation Advocates by Putnam is located at 206 Ave. H, Suite#204 in Marble Falls. I awoke this morning to complete at least twenty-five tasks before passing out this evening fully exhausted. Somewhere I will fit in a passing kiss for my wife and try to graze my kids with a peck on the forehead or a sideways hug before sending them to the shower and finally to bed. The routine will end after a few reminders and maybe even a few threats to get them to sleep. To credit my wife and I, we do read to our three-year-old before the battle begins to get him asleep every night. Many of the people reading this blog know I am a funeral director and many have sat with me describing a loved one who recently died. Over the last couple decades, I have heard “he was a hard worker” or “she was dedicated to her job or civic organization” countless times. When I follow up with a second question about hobbies or experiences of which the individual was proud, I am met with a “it was always about work” or “he/she did not fish, travel, hunt, read, etc.” Nothing! Loved ones cannot think of anything except how serious non-family commitments were prioritized over internal family commitments. One can only speculation how long Haley’s break will last, as the political door remains open. My wish for Haley is to live like she is dying without the dying part. To “overload her senses” as Ali described. My hope for Ali is a treatment or miracle will happen and this all turns out to be a lesson on life perspectives and what is truly important. https://www.cremationadvocates.net/wp-content/uploads/2018/10/accessory-antique-assorted-859895.jpg 2362 3543 Jessamyn https://www.cremationadvocates.net/wp-content/uploads/2017/03/creamation-advocates-logo-300x151.png Jessamyn2018-10-11 13:20:522018-10-11 13:20:52What is Your Testament? People generally think of catering for big life events such as weddings, anniversaries and graduations. These are typically events with set dates that can be planned well in advance. Celebrations of Life and Funerals rarely fall into this category as too often a loved one passes away unexpectedly. Losing a loved one can be an arduous time for families and Hey Diddle Diddle Catering understands completely. We are collaborating with Putnam Funeral Home, Cremation Advocates by Putnam, and Bertram Funeral Home to support you in your needs for sensitive planning & catering in the Highland Lakes area. Whether you are celebrating a joyous occasion or saying farewell to a loved one, food is always a key component of social gatherings. The act of breaking bread and sharing fellowship has been an integral component of ceremonies for many years. However, preparing such a desirable meal for a life celebration and/or funeral can be a difficult, near impossible task for just yourself and immediate family. In fact, providing food and drinks for guests at the memorial service isn’t likely to be at the top of your to do list. Our professional catering staff at Hey Diddle Diddle is adept at handling all of your hospitality needs in a dignified and efficient manner. This will help relieve the family of the burdens of planning for food and drinks at the funeral and/or memorial service. Our Celebration of Life caterers take care of everything from menu planning – with your input of course – to table settings to final clean up. This allows you to attend to your own needs and the needs of family and friends struggling with the loss of your loved one. We offer a variety of menu and beverage service options for you to choose from or we can customize a menu that suits the needs of your family. We’ll work with you and the Funeral Home to help decide the appropriate catering service for your family and friends and for your budget needs. For more information, please contact us at Hey Diddle Diddle Catering. We would be honored to serve you in your family’s time of need. Serving Liberty Hill, Bertram, Oatmeal, Burnet, Marble Falls, Granite Shoals, Highland Haven, Kingsland, Tow, Llano, Buchanan Dam, Horseshoe Bay, Cottonwood Shores, Meadowlakes, Round Mountain, Spicewood and surrounding areas. Written by Brittany Carrington, our newly certified Funeral Celebrant. A celebrant is a person – male or female, clergy or layperson – who seeks to meet the needs of families during their time of loss by providing a funeral service that is personalized to reflect the personality and life-style of the deceased. Having been in the funeral industry since 2008, I have seen my fair share of cookie-cutter funerals. You all know the type! The officiant, having had no contact with the family, comes to the funeral with a pre-formatted order of service, chats with the family for 10 minutes on what songs they will be playing, and walks up to the podium. After introducing himself, he says, “I didn’t know Mrs. Smith, but…” and then continues with an opening prayer, a few songs, reading of the obituary, message, and closing prayer. I state this example – not out of disrespect for those who officiate services, as in some case the minister was called at the last minute and had no choice – but to emphasize the importance of the role of a Certified Funeral Celebrant. I recently attended Funeral Celebrant Training in Las Vegas, Nevada. During the training, I sat in a room full of clergy members, funeral directors, chaplains, and other attendees from various professions. We were subjected to the good, the bad and the ugly in funeral service. We discussed some instances where funeral services caused more harm than good and other instances where they were a healing balm to a hurting soul. Obviously, it was our goal to learn how to provide the latter. By the end of the training, we had been educated on the necessary elements of a meaningful funeral service, equipped with tools from other skilled and experienced celebrants and, finally, given the opportunity to practice our newly acquired skills. This was the frightening part. We were split into groups of two and assigned a death scenario, such as natural causes, SIDS, cancer, accident, homicide, suicide and overdose, etc. We were to fabricate the name of the decedent, their history, family and other details. Next, we were to create a personalized and meaningful funeral and present it to the class. My partner and I were assigned one of the most difficult death scenarios…suicide. As we began to fabricate a story about our suicide victim, my partner burst into tears and said his close cousin had committed suicide some years back and it would mean so much if we could create our celebrant service in his honor. At that moment, it became very real for both of us. We were no longer fabricating a funeral, we were honoring a life. As the details began to unfold, we were planning a service for a 45-year-old Vietnam veteran who had experienced a life-changing event when, one day after he was transferred to a new platoon, his old platoon was wiped out. For the remainder of his life, he struggled with PTSD, guilt, depression and an obsession with danger that landed him in the hospital on several occasions and, once, an extended coma. His injuries led to an opioid addiction that controlled his life and resulted in him losing his family. It was an extremely difficult task, but my partner and I created a service that honored a life without hiding or brushing over the truth. Instead, we created a safe place for people to feel…to express emotions when words weren’t sufficient…a place to heal. We acknowledged the pain of those left behind with poems and words of comfort and established the significance of the beloved decedent with a video tribute (all pretend, of course). According to Doug Manning, the founder of our celebrant training program, “When words fail, ceremony takes over.” Our hypothetical funeral included elements of ceremony with meaningful songs and military honors. All the hypothetical attendees took home a little American Flag in tribute of the deceased that they could either keep in his memory or place on his grave at a later date to show evidence of their visit. The core message of our service was that…he mattered. In planning this hypothetical service, my partner and I took the core elements we learned in training and applied them in a way that highlighted the significance of a life and encouraged a healing and safe atmosphere in which the family could cherish memories, express emotions and share in their grief. My passion is to serve families on a more personal level and offer a service that will lay a solid foundation for their grief journey. It is a common misconception that a viewing and funeral bring “closure.” However, as wisely stated by Doug Manning, the grief process will consist of many “closings,” events that promote healing. There is no magical moment when closure comes and grief is gone. Grief is a process that must be walked through. Many who have been through the grief process can testify to the waves of grief. One minute you are fine and the next minute, you are crying your eyes out. This is normal and contributes to healing. As a licensed Funeral Director and Certified Funeral Celebrant, I not only orchestrate the business side of the funeral planning process, but I also help the family create a meaningful funeral service that provides a safe atmosphere where people feel permission to grieve and express emotion through song, ceremony and participation. One that ultimately celebrates the significance of a life and honors the reality of a death. Just like a small droplet in a large body of water will result in far-reaching ripples, each life is significant and deserves to be celebrated for its uniqueness and lasting impact.